First things first, what is the Email Autoresponder? 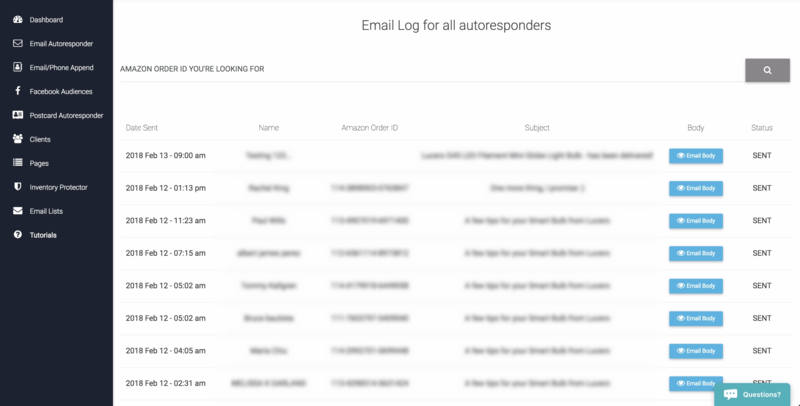 The Email Autoresponder is a tool that lets you automatically send emails through the Amazon Messaging System to your Amazon clients based on order status events. For example, you can automatically send a manual for your product as a PDF attachment when the system detects that the package has been delivered or shipped. 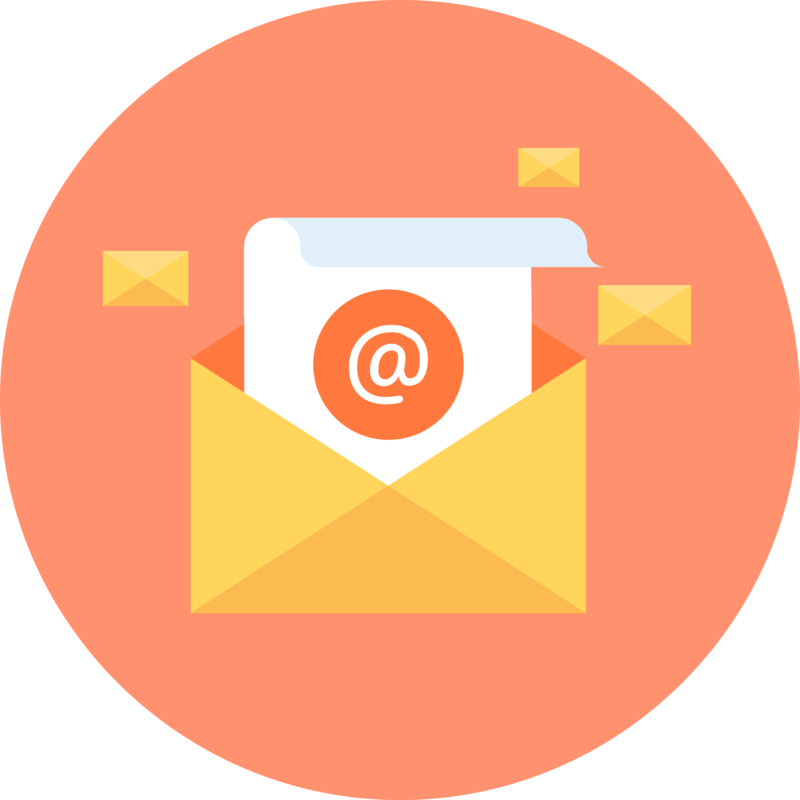 To use the Email Autoresponder system (or EAR) you will need to connect your Amazon Seller Central account through Amazon API (called MWS a.k.a. Marketplace Web Service) with ZonPages. You can do this from the dashboard. Just click on the MWS setup link and follow some easy steps. If you have already have done this then you can skip this part. Once your MWS has been set up you can start up with your EAR system. By clicking on the Email Autoresponder link on the left menu. If this is your first time using the EAR then you will be asked to set up some basic configuration. First, you need to set your From email address. This is usually the email address you use to login to your Amazon Seller Central. You can’t use any other address, the Amazon Messaging system will just reject your emails if you do. On the next field, you can set your Signature, it’ll be added to each email that is sent out. This could be your name or company name. We automatically track any packages sent by USPS, FEDEX, DHL, and UPS. This allows us to detect the exact delivery date. However, not all packages are sent using these shipping carriers. Some less-known carriers often do not have a way for us to detect when a package is delivered. To still trigger the delivered email around the delivery date we offer the “Use Estimated Delivery Times for Unsupported Carriers” option. Basically, in these cases, we will assume that a package has been delivered on the estimated delivery date that Amazon gives us. 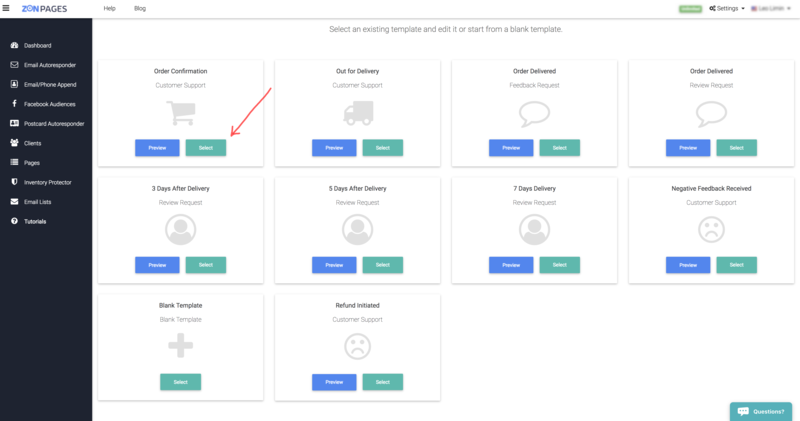 You would want to use this option if in your Marketplace the supported carriers are not very common and if you want to trigger on more orders. Actually, this option should be enabled unless you have a very specific reason not to. The last option allows you automatically blacklist buyers that have returned a product. 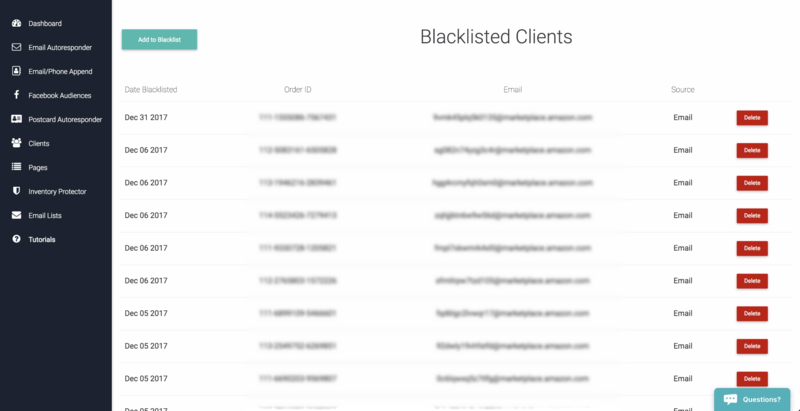 This will stop any further emails to the “blacklisted” buyer. Click save to continue to the EAR dashboard. Let’s start creating your first EAR. 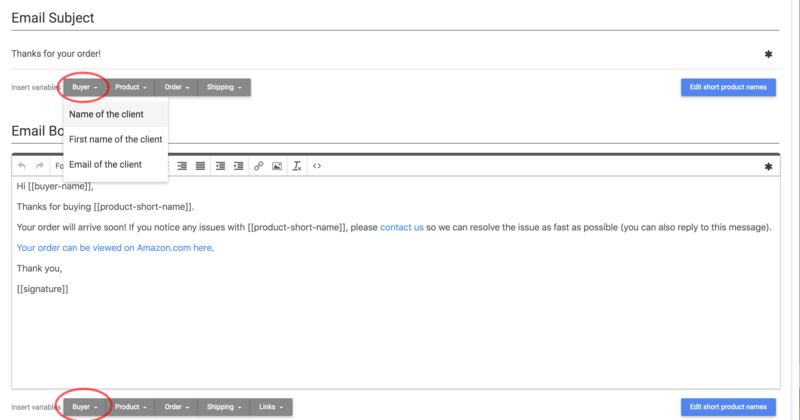 Click on the “Create” button in the New Email Template section. You will now be able to choose any of our existing templates or just compose yours from scratch. It can be anything from Order confirmation all the way to Refund Initiated or even certain days after the Delivery has taken place. Now you can customize your EAR in 4 easy steps. 1 First, you will be asked for which product this EAR should trigger. You can select all products, just one or make a selection of a variety of your ASINs, it’s completely up to you. If you use very long product titles in your Amazon listings then you might want to set up a short name for each ASIN you use. 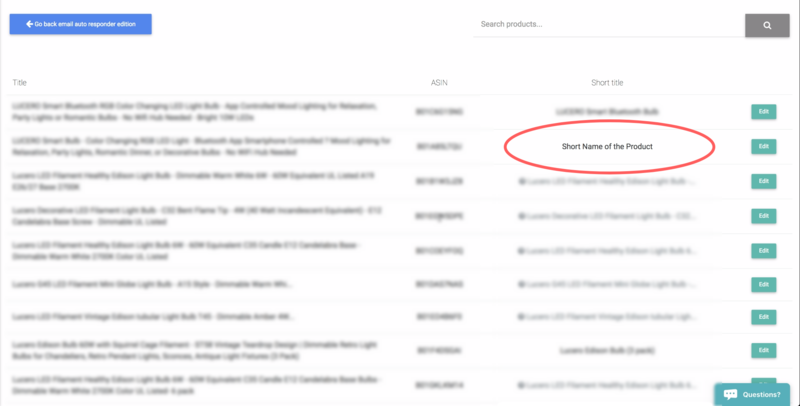 You can do that by clicking on the “Edit Short Product Names” button. The advantage of using short titles is that your emails will look cleaner when you send them out and customers won’t feel overwhelmed by so much text. Click on “Next” when you are all set here. 2 On the next page, you can determine on which event you want to trigger this EAR – when you want it to be sent out. Confirmed, when an order has been confirmed. In some cases Amazon skips this event, in that case, it will trigger on Shipped. Shipped, when an order has been shipped from the Amazon warehouse. Marked “Out for Delivery”, when the package is out on the truck and is about to be delivered. Keep in mind that this only works with supported carriers. Negative Feedback is left, when a buyer leaves you negative feedback for an order. Delivered, when a package has been delivered. Product returned, when a package arrives at an Amazon warehouse after it has been returned by the buyer. Refund initiated, when the buyer has asked for a refund. This requires some additional setup of an email forwarder. Select Refund initiated to learn more, but don’t worry it’s a very easy process, we’ll cover it in a different post. 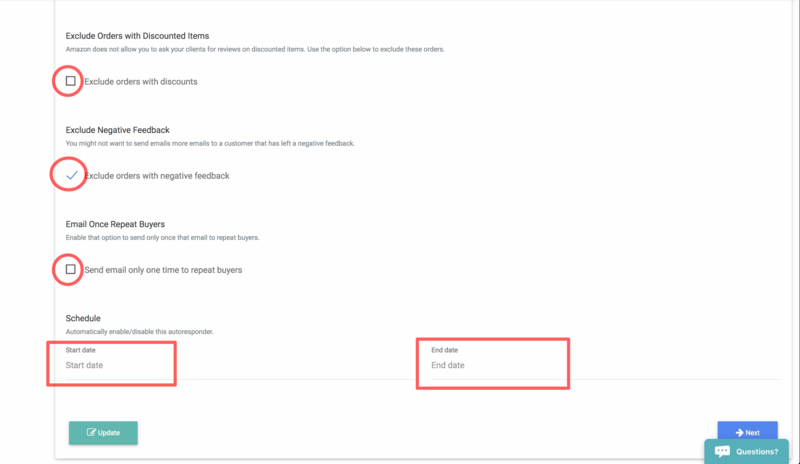 The next option allows you to exclude orders from buyers that had some kind of discount, you may want to enable this if you are running a promotion using coupon codes. Exclude negative feedback allows you to stop sending emails to clients that have left you a negative feedback. You do not want to send “How did it go?” or “What do you think of us?” emails after they already have left a negative feedback. Email Once Repeat Buyers makes sure that we do not send emails to a buyer that has already bought from you so they only get one email. And finally, you can set a schedule for your EAR. You might want to send out a specific email around the holidays. But if you want it to work every time someone buys your product you’d need to leave those blank. Before you start editing your email it is very important that you understand the limitations Amazon puts on sending emails through their Messaging system. Not following these guidelines can lead to your emails not being delivered or even as far as getting your Amazon Seller account banned. I’ll leave you a couple of links where you can read everything about it: Messaging Service, Amazon’s Allowed HTML, and Amazon’s Prohibited Seller Activities. 3 Now you can set the subject and body of the email we will send out for you. You can use different variables or short-codes to auto-replace texts in your subject or body. To add these to your email you simply have to click on the preset short-code buttons next to the words Insert Variables. The top ones work on the subject and the bottom ones for the actual email content. You can also upload 3 attachments with a total size of about 10 MB. The type of files you can upload are limited to documents with extensions like .txt, .pdf, .doc, .jpg, etc. These limitations are in accordance with the guidelines of the Amazon Messaging system. Click on “Next” when you are done. 4 Finally, give your new EAR a name and click on Update. Remember Update is your saving button, if you don’t click on it you might lose all your hard work. Your EAR has now been created and you should see it in the list of EAR’s you have configured. Note: the page you’re automatically redirected to can also be reached by clicking on the Email Autoresponder link in the menu on the left, and then selecting “Manage” underneath email campaigns. Edit, Just in case you missed anything and want to edit your EAR. Activate, Activate your EAR and start sending messages. Remember you need to activate it for it to actually start sending the emails. Send test email, See a preview of a test email and send it to your private email address. See log, See all emails that have been sent by this EAR. Delete, permanently remove the EAR. Check Order, This option is available once you have activated your EAR. This function is very useful for understanding why your EAR has not sent out emails yet. When is it going to start working? First of all, any EAR will only trigger on orders placed after the activation date or your EAR. Any order that was placed before the activation of the EAR is automatically ignored. Even if it matches the event of the EAR. This is done to prevent sending out a massive amount of emails when you activate your new EAR. If you are in doubt, just click on the Check Order button and enter the order ID you think it should have triggered for. You can then see the exact status of this order and why it has not triggered yet. 2 The Email Log option. This page will display a list of all the emails we have sent out for you, you can see the content of every single one of them. You can even search for any email you want just by inserting the Amazon Order ID on the search bar. 3 Another option is your personal Blacklist. Any buyer in this list will be excluded for any of your EARs. You can manually add your buyers to this blacklist by simply entering the Amazon Order ID. And if needed you can also search and remove buyers manually from it. 4 Lastly, on the EAR dashboard, you can also find two graphs which indicate how many emails we have sent out daily and your daily order statistics. Don’t spam! We recommend not sending more than 3 messages to each buyer. Read what is allowed by Amazon and what’s not. This can prevent delivery issues or worse. For example, you can’t link to any external websites from your emails. There are no engagement statistics. Any type of engagement measuring would require the use of third-party links or images hosted on a third-party service. Which is not allowed by Amazon’s TOS. This means you cannot know who actually opens your emails and who doesn’t.